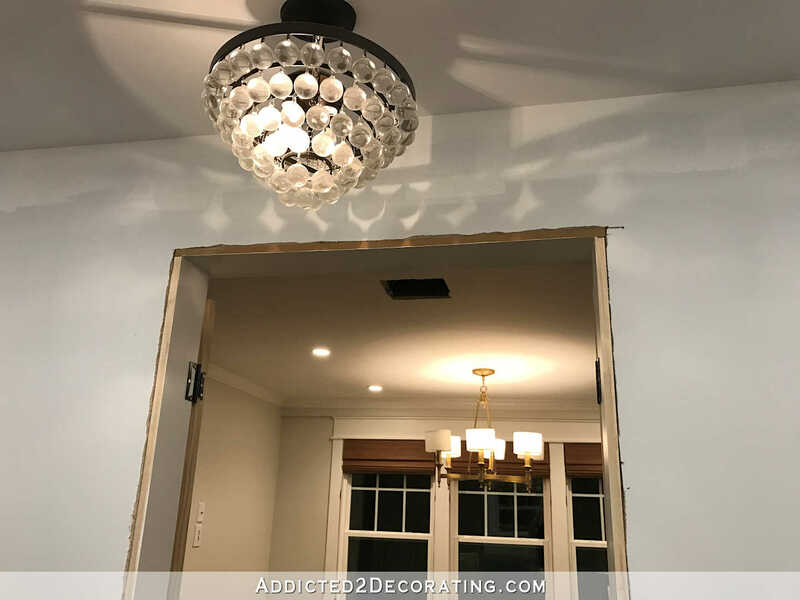 One of my biggest projects on my “to do” list for this month (you can click here to check out this month’s goals) was to make and install double glass doors on my pantry doorway. 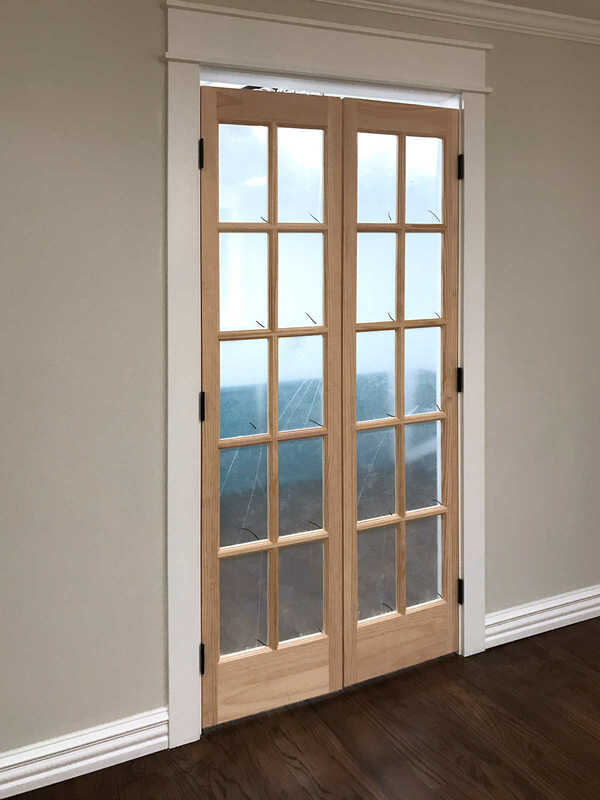 So a few days ago, I inspected the old wood doors I had stacked in the sunroom (i.e., the old solid wood doors that were original to the house that I had planned to use to create my new French doors), and realized just how banged up and chewed up those doors were on the edges. In order to do a really nice job, the project would require tools that I don’t have, like a planer and jointer. So my options were to find a planer and jointer that I could borrow or spend $500+ on a new tool that I really don’t have room for at the moment. I decided to measure the doorway opening and see if I could come up with a Plan C. When I framed out that doorway, I didn’t measure to be sure it was an exact measurement. Since I was planning on making the doors, the doorway could be any width, and I’d make the doors to fit. So imagine my shock when I measured and found that somehow, quite miraculously, the doorway width was exactly 36 inches. That opened up the possibility of using ready-made doors. I got online and started searching for a solution, and found these bifold closet doors that were perfect for this project. My local Home Depot didn’t carry them in stock, so I ordered them and had them shipped to the store for pickup so I could get free shipping. They are really beautiful doors, and came packaged very well. Some of the panes of glass look broken, but that’s just wrinkles in the plastic that covers each pane. Since they are bifold closet doors, they come hinged together at the center. 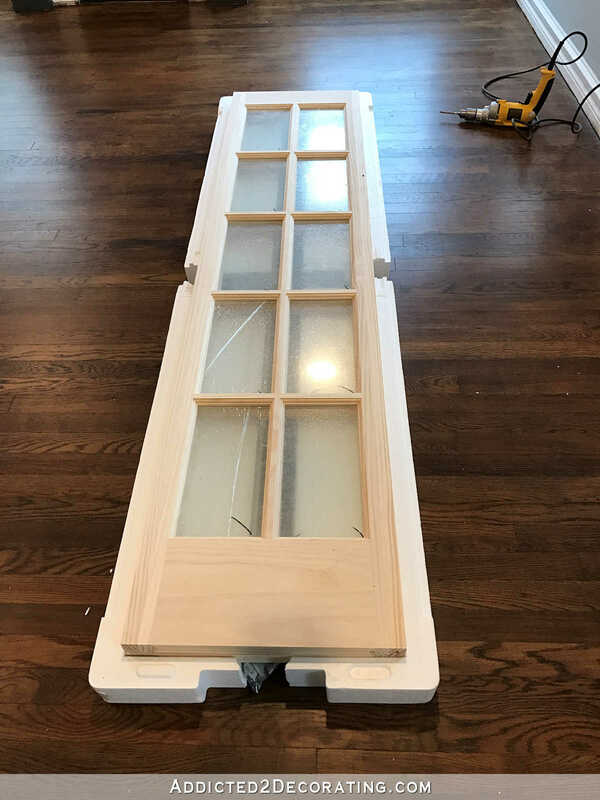 To turn them into double French doors, I turned the doors onto the edges, with the existing hinges down, and installed new hinges on the edges that were pointing up. These doors are kind of heavy, so I used three hinges per door. Then I lay them flat again and removed the center hinges holding the doors together. 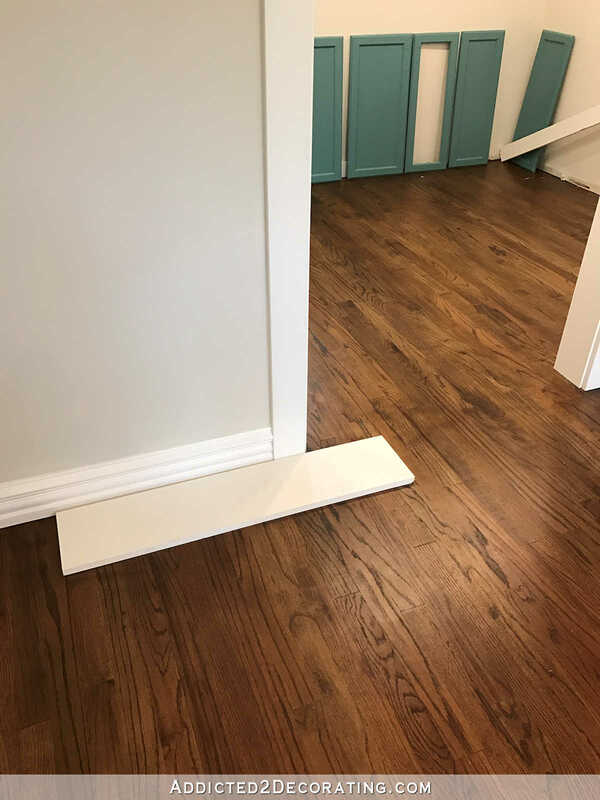 Before I carried one of the doors into the breakfast room, I placed a scrap piece of 1 x 6 on the floor to place the door on in order to allow for the appropriate gap below the door. Then I placed the door onto the lumber, lined up the hinges on the door jamb, and screwed them into place. Then I repeated that process on the other side. 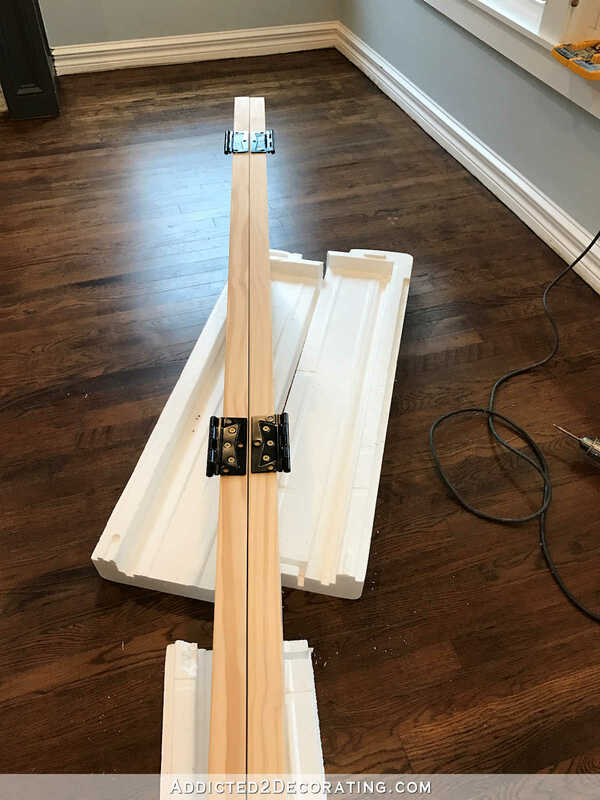 To make this even easier, I used non-mortise hinges so that I wouldn’t have to mess with routing the doors and door jambs to make room for regular hinges. Non-mortise hinges are surface mounted on both the doors and the jambs. The Home Depot here only carries them in brass, so I used some spray paint to paint them black before installing. I still need to touch up the screw heads. And just like that, I had French doors on my pantry. Thirty minutes of work, and done! The doors I was planning on using to make my custom doors are a true 80 inches high. These doors, while they’re labeled 80 inches, are actually shorter, as all bifold closet doors are. So now I have to make some adjustments. I don’t anticipate that this will be a big deal at all. …and then add a spacer to the existing top door jamb, and install a new lower top door jamb. In other words, I’m not going to remove any of the existing jambs. I’ll just add a new one that’s lower. Then I’ll cut down the side casings and reinstall, and then reinstall the top casing. So it really shouldn’t be a big deal at all. I’m actually glad that my original idea didn’t work out. This was so much less stressful, and I think the doors are beautiful. And best of all is that I think these doors will take one more day of work (maybe two with the priming, sanding, and painting), and then I can finally cross something off of my list for this month! It’s already the 13th, and I’ve yet to actually complete any of the projects on this month’s “to do” list. It’ll feel great to get such a big project done! I think they are called “ball and catch” hardware. That was a great find! I’m so glad you are well on your way to crossing this off your list. The doors look very nice! Just curious, are the doors upside down? Maybe it’s just the way I look at them. Not sure if the larger wood part was supposed to be at the bottom, but for some reason my mind is telling me it should be up top, or there should be an even distribution on top and bottom. The larger section always goes at the bottom. Since you’re going to paint these anyway, wouldn’t it be easier to just add a piece to the top of each door? Maybe I think so because I can’t picture what you described doing instead. 😉 In any case, they look gorgeous! Congrats on some major progress! I considered that. 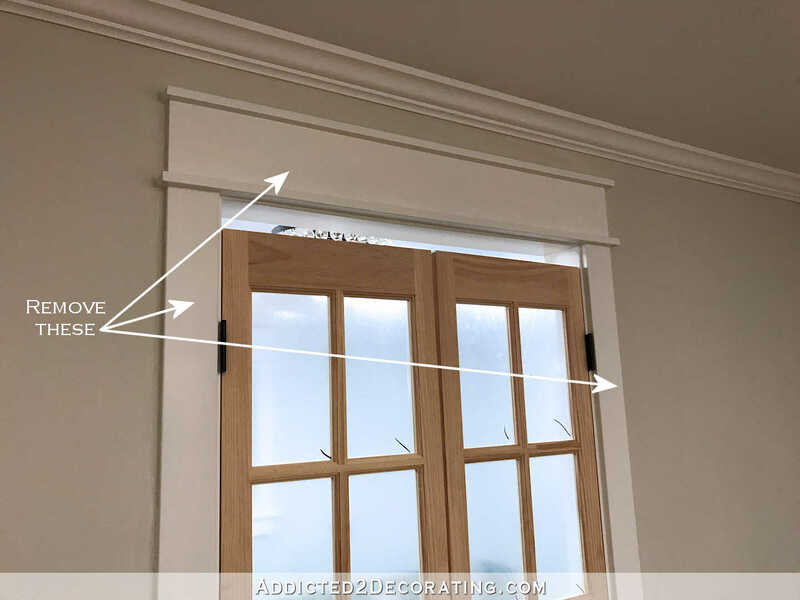 On my bathroom doors, where I also used bifold closet doors as double doors, I did add some height by attaching wood pieces to the bottom of each door. Once they were sanded and painted, they weren’t noticeable at all. But on these doors, I do think just making some adjustments to the trim will be much easier. I’ll take pictures along the way so the process is clearer. I didn’t know if I’d like the glass bi-fold doors to your pantry but I DO! Love them, in fact. I think readjusting your trim will be a smart thing to do. Kristi, wouldn’t it be easier to build up the doors? I personally think that would be harder. Everything you do is a big deal to me. I am always so impressed and jealous of your skill. Beautiful job!! I concur! Kristi you make it all look easy with your tenacity! They look great! Looking forward to see the rest – the thingies at the top that click together, etc. Hope you’ll take pictures to show us. 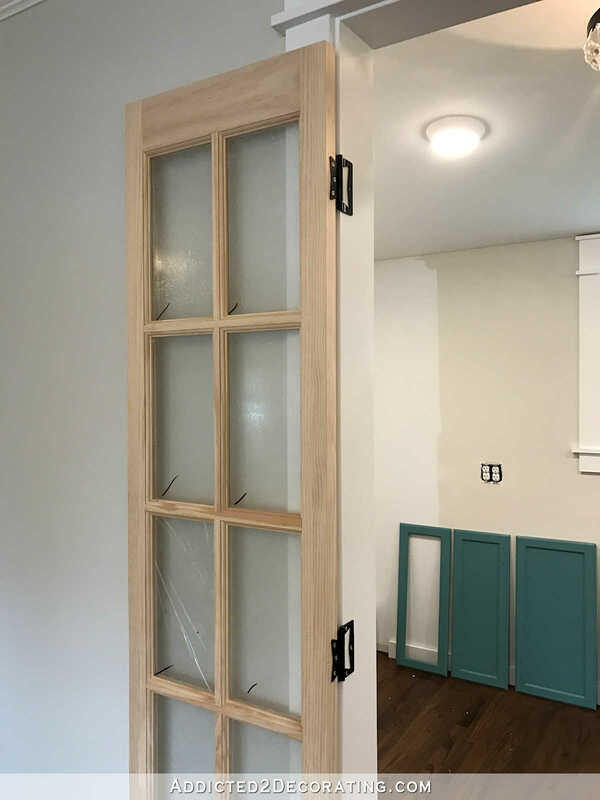 I am going to install something similar on my pantry, but I’ll have to trim them, as there is probably no 90 degrees angle in my house, all the door openings are not quite square. I have the tools to do this but it is a pain in one place and time consuming. It is very satisfying to be able to tick things in the to do list 🙂 Very glad for you! Beauties! I totally get what you plan to do, and while it is a bit more time consuming, I agree that it is the best way to alleviate the gap. Adding an additional piece of wood will throw off the style of the doors. I am wondering if you thought of having those swinging door hinges, so you could just push from either side without using handles? Also, does the light in the pantry operate independently from the rest of the space? Wish I had thought to mention earlier that I wish we had added an on/off switch to the hinged side of our pantry. 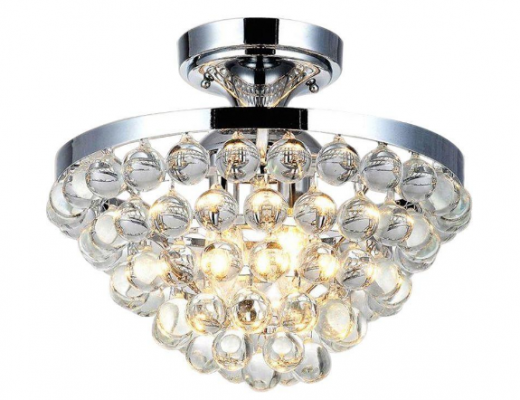 We are constantly leaving the light on when we leave it! We have one on our master closet, but didn’t think to add one in the pantry. Open the door, light on. Close the door, light off, just like a refrigerator! Love them! Love the idea of the swinging door or Saloon Door swing. I’m imagining if you have your hands full of groceries you could use your hip to open it instead of placing them down and pulling open. Or perhaps I’m turned around. But either way, something to look into. Very exciting to see this come together. I agree with Karen above and am happy it all worked out so well. I love your your doors and they will be even more beautiful once painted. I love reading how you do things the right way! I swear I would have screwed a piece of wood onto the top frame, filled the holes, caulked, painted and called it a day. Yes, removing the frame is the right way. Looks amazing! 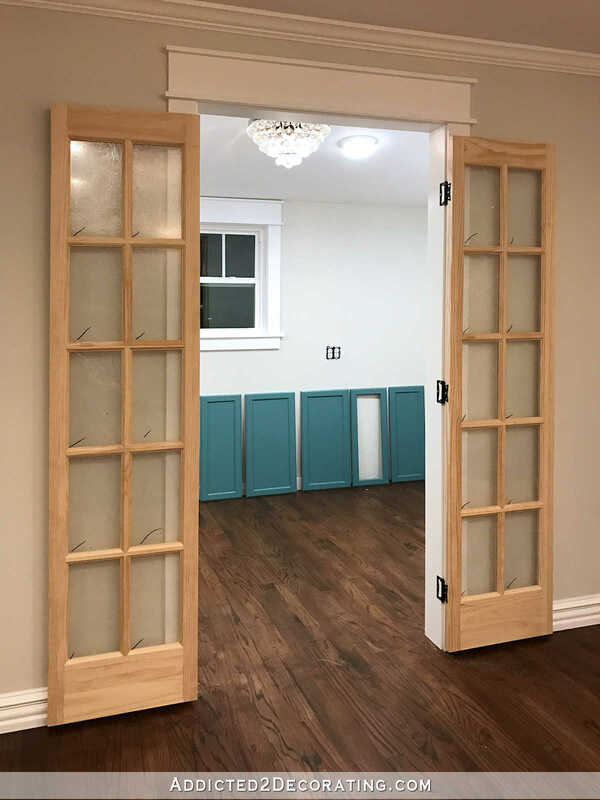 I have the old school looking bifold doors at the entrance to my laundry closet these look like something I can definitely look into! Looks wonderful! You are a marvel!!! Just curious…not sure if you mentioned it in the past or not but what color are you planning to paint the new doors? White like the trim or blackish like the entry door? amazing idea on the doors, but the glimpse of the teal cabinets were what caught my eye. I know you’re gonna love that color. It goes perfectly with what you’ve done and it’s really you! I laughed when I read “exactly 36 inches”. Sometimes God throws us a bone…and, if we’re smart, we are SO grateful. Those doors are perfect! I really like the doors! 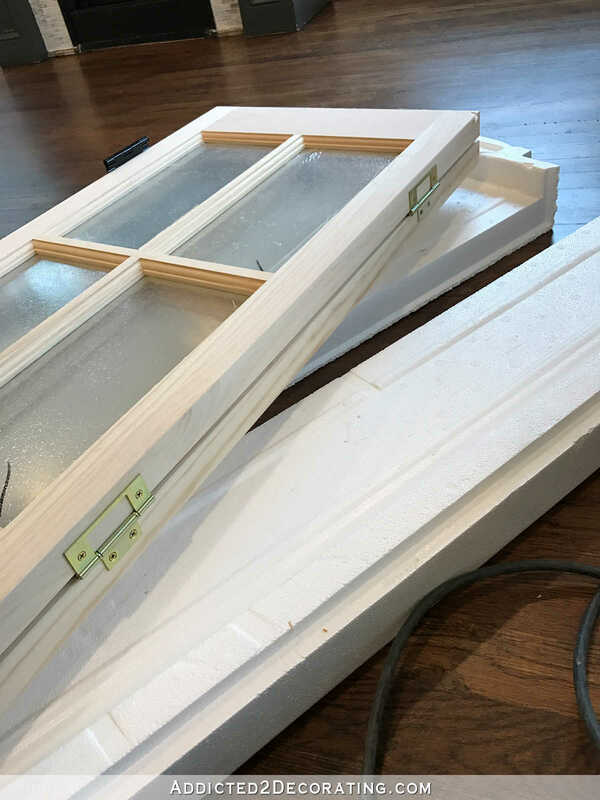 I think I would have installed them with a little more room at the top and a little more room at the bottom so there would be an even gap both ways – then you would not have to go to the extra work, but I know you are too much of a perfectionist to just rig something like that. So are you going to show up a step by step of how you do this? Thanks! I think I would have probably looked into post hinges so they’d swing both ways like a restaurant kitchen door (or a bar saloon door). Might be a tad easier to open/close with stuff in your hands. I think if you get the right ones, they automatically position themselves centered when they close and if you push beyond a ball stopper in the hinge, they stay open on their own. Oooh! I like Justin’s idea. I believe those are called double acting hinges. Kristi,your pantry will be beautiful, but in full sight, will it be hard to keep things straight after you finish? Of course, that would be my problem! 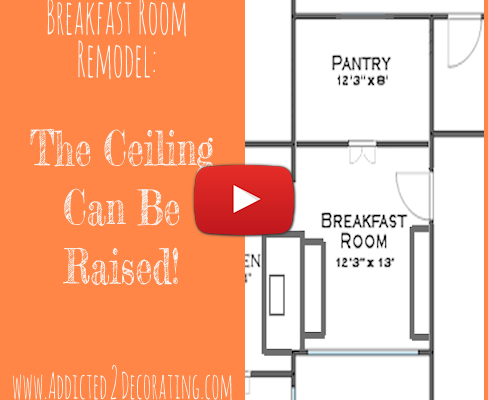 I am anxious to see the breakfast room finished and decorated! Oh you clever girl! I’m so in awe of your skills! Love, love, love! And I am so inspired by your skills, you actually make me think I could learn to do my own handywork! I can’t wait to see everything complete, it is so fund to follow you on this journey! 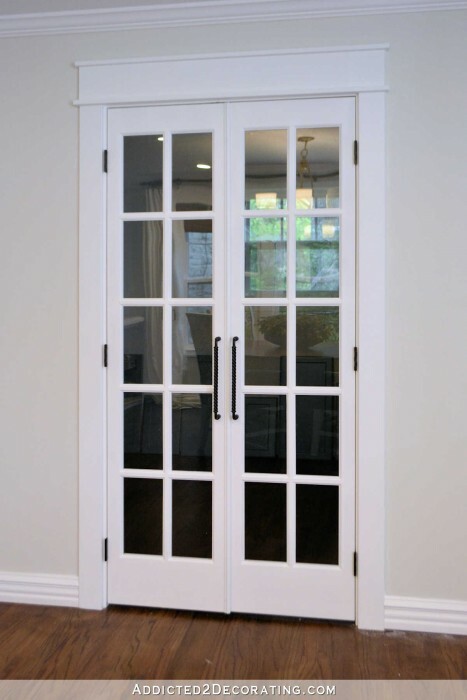 It would be fun to have a transom window above those doors as well, if you have enough space…and a transom window! LOL! Love the doors….they are very classy looking! This looks awesome! Great job again! I don’t know, Kristy. I keep thinking about and looking at pics of this room! The stained like the table idea started getting to me. 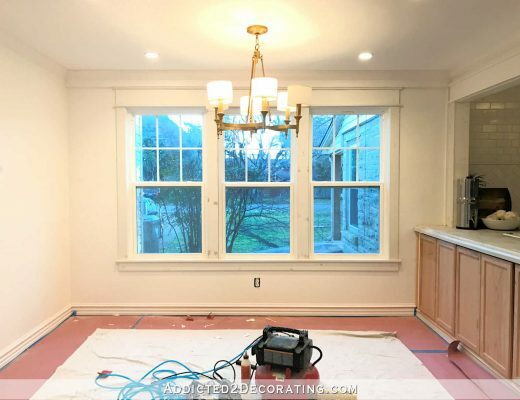 Wish I could see the whole room to feel how much space is between the table and French doors. If you were to try the stain, then that would need to be before any paint. 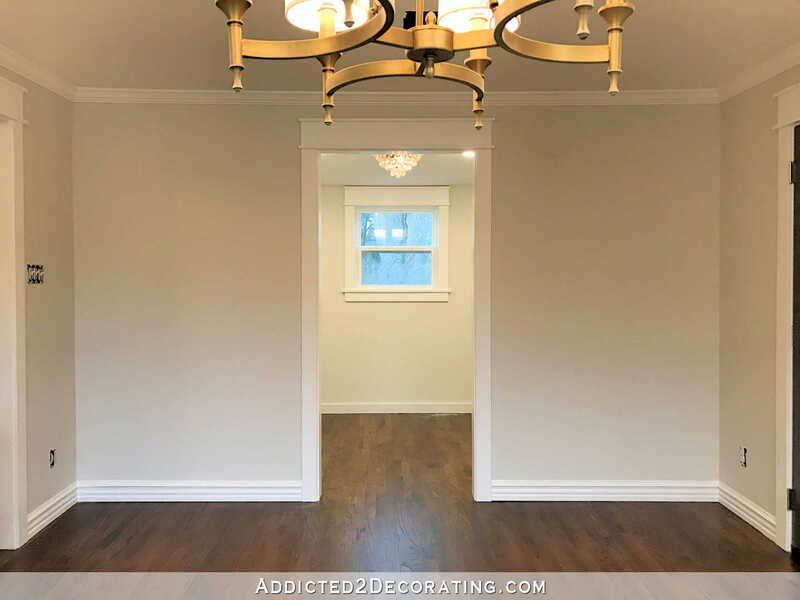 Otherwise, I was thinking you’ll have the white paint for the trim, it would be easy to go ahead and paint the doors white, finish the pantry inside and out (built-ins or sconces outside?) and live with the white a bit. Paint the door slabs charcoal later if you want. But then that stained suggestion got me going! Can’t wait to see what you do!! 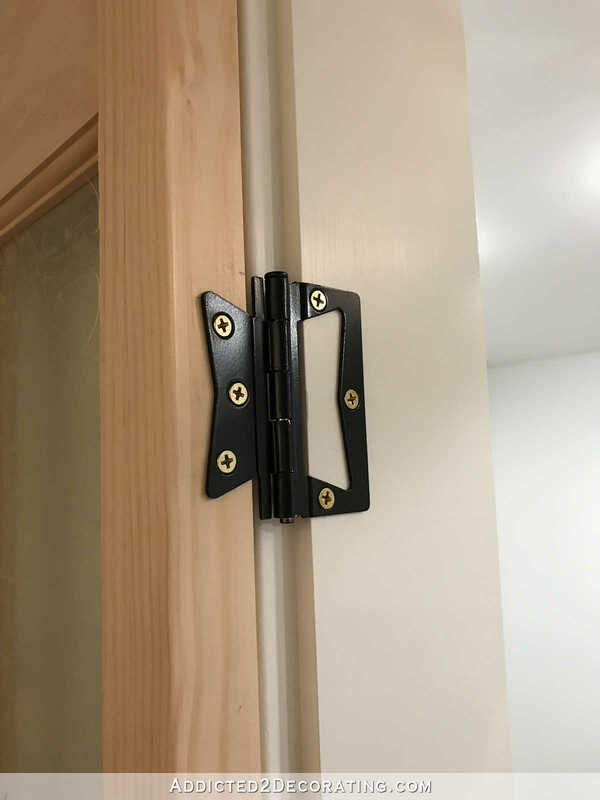 Non mortise hinges are a thing??? You just saved my bathroom project! My “let’s take the wallpaper down” project has me at a point where I can see the subfloor and I need to flip how the door opens but didn’t trust my skills in re-etching how the hinges will fit into the frame. Non mortise hinges are the answer! Immediate text to husband!